Call The PETAL PEDDLER FLOWER SHOP, a PRAIRIE GROVE AND LINCOLN AR flower shop, to order one of our gift bouquets or baskets as a special treat for your lovey. 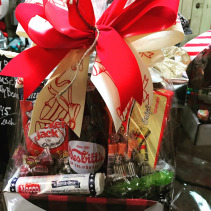 We specialize in custom arrangments so feel free to call us or stop by to discuss a basket filled with favorites or choose from the options shown on our website. Whether your sweetie loves candy or salty snacks, luxurious bath products or aromatic candles, we've got you covered at The PETAL PEDDLER, serving the Lincoln AR, Prairie Grove AR and Farmington Arkansas and surrounding areas. The PETAL PEDDLER provides premier florist services in the Lincoln AR, Prairie Grove AR, Farmington AR and surrounding areas. 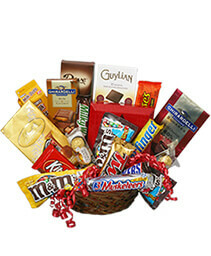 Call us today or place your order online 24/7! 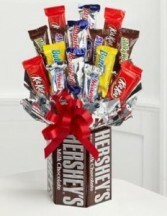 Treat your loved one to a Movie Treats Candy Bouquet. This bouquet comes with your choice of soda pop, Coke, Dr. Pepper or Sprite, 1 bag of microwave popcorn, a box of movie size candy and some smaller bite size candies. 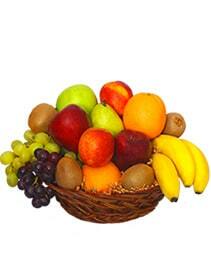 This bouquet comes in small (as shown), medium and large sizes. 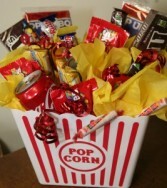 Medium: 2 cans of soda, 2 popcorns, 2 movie size candy and several fun size candies. 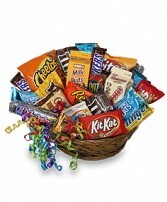 Large: 4 cans of soda, 4 popcorns, 4 movie size candy and several fun size candies. You supply the movie and we will supply the treats! 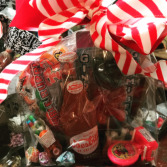 This gift basket is perfect for two lovers and comes with your choice of 2 soda pops, Coke, Dr. Pepper or Sprite, 2 bags of microwave popcorn, 2 boxes of movie size candy and some smaller bite size candies-all in a reusable popcorn bucket. 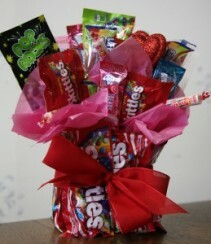 This bouquet comes in a smaller and larger version as well. 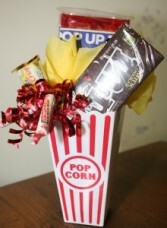 Small: 1 can of soda, 1 popcorn, 1 movie size candy and a few fun size candies. Medium: 2 cans of soda, 2 popcorns, 2 movie size candy and several fun size candies. Large: 4 cans of soda, 4 popcorns, 4 movie size candy and several fun size candies. A beautiful arrangement of luxurious bath products that are sure to make any loved one feel special and pampered. 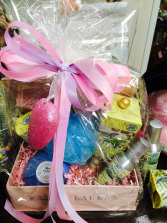 These gift baskets are filled with Michel Design Works and other locally made products.